Up to one in five women and one in ten men are affected by mental health problems during pregnancy and the first year after birth. Unfortunately, only 50% of these are diagnosed. Without appropriate treatment, the negative impact of mental health problems during the perinatal period is enormous and can have long-lasting consequences on not only women, but their partners and children too. However, this is not inevitable. When problems are diagnosed early and treatment offered promptly, these effects can be mitigated. How can the Perinatal Mental Health Toolkit be used? This toolkit is a set of relevant tools to assist members of the primary care team to deliver the highest quality care to women with mental health problems in the perinatal period. As well as offering a diverse collection of resources, the Perinatal Mental Health Toolkit gives details of additional learning for individual practitioners as well as resources specifically aimed at women and their families. Please send any comments or suggestions to circ@rcgp.org.uk. Any agreed updates will be made on a routine basis, unless immediately necessary for factual reasons. The following resources offer information on presentation, diagnosis and treatment both with medication as well as psychological treatment. There is significant geographical variation in the provision of specialist perinatal mental health services across the UK and it is important GPs know where to access further information. 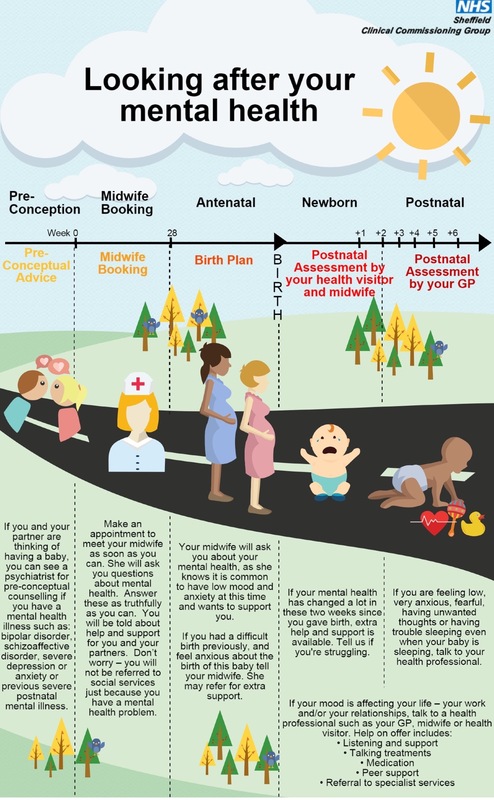 Public Health England Health Matters Infographic: Encouraging a Healthy Pregnancy. North West Coast Strategic Clinical Network perinatal poster: information on taking medication whilst pregnant. The decision to use medication to treat a mental health problem during the perinatal period is a complex one and individual to each woman. Clinicians should be able to help women make an informed decision and the following resources may be assist them to do so. The UK Teratology Information Service provides information for healthcare professionals on the safely of drugs in pregnancy. Best Use of Medicines in Pregnancy provides patient information leaflets on the safety of drugs in pregnancy. UK Drugs in Lactation Service (UKDILAS) The UKDILAS service provides evidence based information on the use of drugs during the breastfeeding period. This website contains links to articles on the safety profile of individual drugs or groups of drugs. Breastfeeding Network a useful website for families including factsheets on safety of medications in breastfeeding. LactMed the Drugs and Lactation Database of the US National Library of Medicine. MHRA Toolkit on the Risks of Valproate Medications in Female Patients (patient card, patient booklet, healthcare professional booklet and acknowledgement of risk form). There is now strong evidence that the risks of using sodium valproate in pregnancy are too high to be considered acceptable and clinicians should urgently review their prescribing of this drug to women of childbearing age. MHRA film on the risks of taking Valpraote medications during pregnancy. NHS Choices Postcode Directory for NHS IAPT Services local services may also be accessible to women via self-referral. To access shared learning networks to assist you in applying practical QI methodologies to better treat this clinical area, join our QI Ready platform. Safeguarding principles underpin the work of all health care professionals who care for women and their families in the perinatal period. GPs should be confident and competent in knowing when to refer cases to third parties. Samaritans UK leading charity working to prevent suicide and support those affected. Suicide mitigation in primary care evidence based factsheet in suicide and self harm prevention, Dr Alyss Cole-King. Suicide in Perinatal and non perinatal women, trends in incidence, Khalifeh H, 2016 Epidemiological paper looking at the trends and themes behind the data in perinatal suicides. MBRRACE-UK Infographic: Key Messages from the Confidential Inquiry into Maternal Deaths 2015 illustrating that mental health causes accounted for almost one quarter of deaths between 6 weeks and 1 year after pregnancy. This section contains websites, information leaflets, media and literature recommendations that health care professionals can direct women and their families towards to assist with the understanding of Perinatal Mental Health problems. It also provides links to social support organizations for families and self-help resources, including novel social media approaches. Best Beginnings: Out of the Blue Campaign to improve awareness and access to help for perinatal mental health problems, including informative videos. Perinatal Positivity: a short video using the real voices and experiences of women and men who have had mental wellbeing difficulties around the time of pregnancy, childbirth and beyond. Royal College of Psychiatry: what are perinatal mental health services? Two in Mind Project information and resources aimed at supporting women in the perinatal period produced by Mind Cymru and the Welsh Government. Home-Start Charity Practical support and friendship for families with young children. Family Action Practical, emotional and financial support to those experiencing poverty, disadvantage and social isolation across England. Self care resources, also offering peer support services. Action for Children offering support for families, help on fostering, adoption, children in care and disabled children. Gingerbread Advice, information and practical support for single parents. Family Nurse Partnership A voluntary NHS programme for first time young mothers, aged 19 years or under. A specially trained family nurse visits from early pregnancy until the child is two, working in partnership with the mother to optimize outcomes for the new family. Cry-Sis Support for parents of babies with challenging behaviour, excessive crying and sleeplessness. Birth Companions London charity providing support to vulnerable pregnant women and new mothers who are, have been or are at risk of being detained. Aware NI Charity supporting people with mental health problems in Northern Ireland. Action on Postpartum Psychosis Peer Support offers on online forum and peer support from women & their partners with lived experience in a supportive and monitored environment. Bipolar UK Support Groups Bipolar UK also regularly run workshops on on the issues faced by women who have bipolar disorder and want to start a family. Big White Wall An online community for mental health support. Available 24/7 with trained ‘Wall Guides’ ensuring the safety and anonymity of members. Bluebell A growing charity based in Bristol supporting mums, dads and families who are affected by antenatal or post-natal depression. Light Sheffield a small charity who offer peer support to mums in the Sheffield area and beyond who are experiencing or have been affected by perinatal mental illness. Shoreditch Trust Bump Buddies Charitable organization providing a support network for new mothers through mentoring, activities and confidence building. Mothers for mothers A charity based in Bristol/South Gloucestershire/Bath/Northeast Somerset offering support, advice, and information. The following are examples of social media and digital technology that women may find supportive. The RCGP cannot take responsibility for social media content and health professionals are advised to cautiously assess their suitability for individual patients. Baby Buddy App for Smart Phone An award winning app developed by the charity Best Beginnings which includes videos, information and updates about the user’s pregnancy and postnatal journey. PNDandMe A peer support Twitter network for perinatal mental health run by Rosey who has lived experience. Rosey can be followed on Twitter @PNDandMe, and has a website with information. A weekly ‘Twitter chat’ (Wednesdays at 8-9pm) can be followed using #PNDHour. #PNDChat and #PNDFamily can also be used to view related tweets. BirthTraumaChat A peer support Twitter network dealing with birth trauma and PTSD run by Emma Jane Sasaru and Susanne Remic. Emma @unfoldURwings and Susanne @maternitymattrs host #BirthTraumaChat weekly on Twitter (Mondays at 8-9pm). #PTSD and #birthtrauma can also be used to view related tweets. Sheffield's Forging Families Organisation that supports, offers information and promotes health and wellbeing for Sheffield families during the perinatal period. Health promotion materials and discussion are shared via their Facebook page. This section contains resources to support parents’ wellbeing, parents with mental health problems and consequently, the mental health of their infants. One in ten fathers develop postnatal depression following the birth of their child and the partners of women affected by perinatal mental health problems are at increased risk of depression themselves. An infant's emotional and social development can be affected when parents are regularly unable to respond to its needs. The most effective interventions for Perinatal Mental Health are also those that promote maternal-infant interaction. Maternal and infant mental health needs can be assessed at every contact and further support offered as necessary. Early Intervention Foundation: What Works to Enhance Inter-Parental Relationships and Improve Outcomes for Children? One Plus One: Strengthening Relationships Charity providing support for couple relationship strengthening including training for healthcare professionals. Parent Connection: Parenting After Parting support for families where there is conflict or separation. Mind Charity has useful resources for parents with mental health problems, support tips and information about social services, and a printable booklet. Royal College of Psychiatry: Parental Mental Illness information for parents, carers and those working with young children. Includes advice on how to help a child understand mental illness. Mental Health Foundation: Advice for Parents includes information on how a parent’s ill health can affect their children and how to protect children’s mental health. Babies in Mind: Why the Parent’s Mind Matters Free course produced by the University of Warwick. The Wave Trust: A Quick Guide to the Age of Opportunity a report explaining the importance of the period between conception to age 2 in contributing to infant physical and mental health. The 1001 Critical Days Manifesto Cross Party and early years organizations joint manifesto on the importance of parent-infant services. Breastfeeding is recommended by the Department of Health and promotes bonding and attachment. Consistent, impartial information assists parents in making decisions around infant feeding. The early months of feeding a baby can be challenging, and skilled compassionate feeding support is important for mental wellbeing. Infant feeding, Wellbeing and Perinatal Mental Health A PDF summary of key issues, online links to infant feeding support, and resources on prescribing for the breastfeeding mother by Dr Louise Santhanam. The GP Infant Feeding Network Website A resource for clinicians to assist with the management of a range of infant feeding issues, including breastfeeding problems. The site also signposts to information on prescribing in lactation, feeding support for parents and learning materials for GPs. National Breastfeeding Helpline 0300 100 0212 Telephone and web chat support from trained breastfeeding volunteers. Open daily from 9:30am to 9:30pm. The Breastfeeding Network factsheets on breastfeeding information, a network of breastfeeding. supporters and the drugs in breastmilk information helpline, led by a specialist pharmacist. The Association of Breastfeeding Mothers Breastfeeding information and support groups. The National Childbirth Trust Offering support groups and an infant feeding helpline. La Leche League Breastfeeding information and support groups. Due to the nature of their work, health professionals may face additional barriers to disclosure, diagnosis and management. If this is the case, the following links may be helpful. The following sections highlight some of the areas in which GPs may need specific information and resources to support their clinical management of perinatal mental health problems. Sadness post birth occurs in all countries but is not always considered an illness. Migrant women therefore may be unable to express their feelings and present more frequently with somatic symptoms. Unfamiliarity with healthcare pathways, lack of social support, economic hardship, cultural stigma and traumatic past experiences may pose a barrier to seeking help, in addition to language. NICE Guidelines CG110 Pregnant women who are recent migrants, asylum seekers or refugees, or who have difficulty reading or speaking English. Better Health Briefing: The Maternal Mental Health of Migrant Women A briefing paper from the Race Equality Foundation. Doctors of the World Charity offering healthcare to those living in the UK who are not eligible for NHS treatment. Refugee Council Offering advocacy, interpretation and funding to refugees and asylum seekers. The risk of postnatal mental health problems increases if a woman experiences a traumatic birth or if there are serious health concerns for baby. Members of the Primary Care Team should assess needs and offer support as necessary at every contact. Pregnancy loss and neonatal bereavement can put a substantial strain on the mental health of the mother and other members of the family, in addition to the related physical issues. Primary Care staff should treat a pregnancy loss at any gestational stage with respect and sensitivity. Women should be reassured that they can attend later if they do not feel ready to discuss in the early stages. Antenatal Results and Choices Charity offering non-directive information and support through antenatal testing and its consequences for fetal abnormality. Petals Counselling for trauma or loss during pregnancy and birth. Provides a free service in London and Cambridge and working to expand nationally. The Miscarriage Priority Setting Partnership (PSP) aims to help women and those affected by miscarriage work together with professionals to agree which are the most important questions that still need to be answered by miscarriage research. The Ectopic Pregnancy Trust supports people who have experienced ectopic pregnancy and provides clinical resources for health care professionals, has information on the physical and emotional experience of ectopic pregnancy, and offers telephone, online forum and email support. National Perinatal Epidemiology Unit report on bereavement in parents of infants. Mothers who misuse substances may feel reluctant to access help due to the associated stigma and concerns about the involvement of social services. Maternal substance misuse can harm a child's development both directly and indirectly, through its impact on parenting capacity. Supportive and coordinated care is recommended in order to minimize harm to the whole family. The role of the general practitioner is to offer accurate up to date information, continuous support and evidence based treatments. The following resources may be used to improve knowledge and understanding of perinatal mental health illness. Network ED a professional forum for those with an interest in improving care to those with eating disorders run by Dr Dominique Thompson, a GP in Bristol. Bipolar Disorder, Pregnancy and Childbirth Podcast produced by the Royal College of Psychiatrists and Bipolar UK. Healthy Child Programme modules on e-Learning for Healthcare platform modules 5 & 6 cover attachment, positive parenting, development and behaviour. Babies in Mind: Why the Parent’s Mind Matters Free course produced by the University of Warwick on Infant Mental Health. There have been some excellent publications in recent years that have done much to highlight the need for improvement of perinatal mental health care and have now started to influence commissioners and policymakers putting the mental health and wellbeing of women having children high up the political agenda. Falling Through The Gaps RCGP & Centre for Mental Health report into the barriers to better detection of perinatal mental health problems, 2015. The Cost of Perinatal Mental Health Problems Centre for Mental Health and the London School of Economics, 2014. Saving Lives, Improving Mother's Care Confidential Enquiry, NPEU, University of Oxford, 2015. Maternity Review 5 year forward view, NHS England, 2016. The health of the 51% Chapter 7 is on perinatal mental health, The Chief Medical Officer Report, 2014. The joint commissioning panel for mental health. Guidance for commissioners of perinatal mental health services, 2012; London: JCP-MH. Commissioning Review paper advising all women should have access to specialist mental health trained health visitors. Maternal Mental Health Alliance: Everyone’s Business Campaign features UK mapping of specialist perinatal mental health provision and MBU beds and stressing the importance of tackling the UK geographic inequity in service provision. Also see MMHA's June 2016 report. 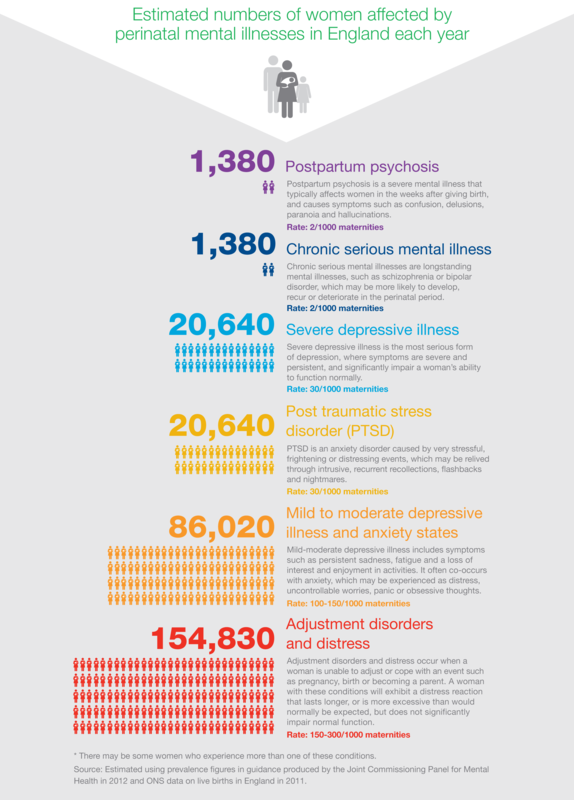 NSPCC Infographic on the numbers of women affected by perinatal mental illness in England every year. Health Matters: Giving Every Child the Best Start in Life guidance from Public Health England stressing the importance of perinatal mental health in the promotion of child health, 2016. The RCGP works in collaboration with the Maternal Mental Health Alliance which is a coalition of over 70 national professional and patient organisations committed to improving the mental health and wellbeing of women and their families in the perinatal period. vi) MMHA – much of the information has been obtained from the websites of members of this alliance, of which there are over 80 and the names can be found here. vii) the developers of all the resources credited within the toolkit.